In the late 1930's and into the early 1940's a number of recordings of Mengelberg conducting the Royal Concertgebouw Orchestra were made to an astonishingly high quality by the semi-private Dutch broadcasting organisation AVRO. They were cut directly onto glass-backed acetates and later transcribed to tape, from which a number of releases have been sourced. Already on this site you'll find Mengelbergs' 1939 Mahler Symphony No. 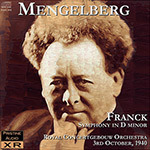 4 and his 1940 Brahms Requiem, and now we're able to bring the XR process to bear on this superb 1940 Franck recording. Fortunately in this case the acetates were in a much better state than the previous two recordings I worked on, which left me to concentrate on getting the very best sound quality out of the music, rather than the worst of the noise away from the music! What we hear is a superb performance, and a truly excellent recording for its day.